The town of Katsunuma where Asunaro-en is located is nationally famous as a place blessed with the ideal climate for growing grapes, peaches, and cherries. Those are the main produce of Asunaro-en. We offer all-you-can-eat courses for all the varieties available so that you can come back as many times as you can during each season. We use compost and the minimum amount of chemicals to ensure safety and great taste. You can also purchase special gifts and enjoy hoto noodles, local specialty of Yamanashi, as well as whippy ice-cream made with kyoho grape. Come to Asunaro-en! All the staff awaits your visit! “Hoto” is at the top of the list of Yamanashi’s local specialty. We use only the best locally-grown ingredients for our hoto: fresh vegetables, eggs from the Kurofuji Farm, and pork grown with local wine. You can also enjoy curry, everyone’s favorite, and our original premium wine. Asunaro-en boasts a 0.8 acre greenhouse for cherry picking, where more than 200 cherry trees are grown. Enjoy picking fresh and juicy cherries to the full! Rain or shine! Pick two peaches in the field to take home. Then enjoy deliciously cool peaches all-you-can-eat at the table! ・Harvest Course: \1,500 per person Available until late August. Pick peaches to fill a box and take home. *Limited to the number of peaches that can be placed in the box in one layer, about 5 to 9 peaches. Enjoy a deliciously cool peach at the table. 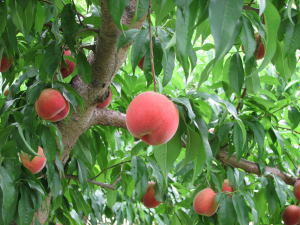 We grow wonderful peaches at Asunaro-en. A freshly-picked peach is sweet and yet still firm. After a quick rinse, you can bite into it like an apple. Only the very fresh peaches eaten right away taste so crisp and good. We hope you enjoy it. After being taken home, the peaches ripen in three to four days and become creamy soft and very sweet. If you wish to enjoy both, come pick your own at Asunaro-en. Includes grape juice fountain plus a free cluster of grapes! 12 to 15 varieties can be enjoyed within a single field throughout the whole season. There may be as many as 25. One of our staff will give a tour, explaining different varieties from all over the world. After the tour, you can pick and enjoy the variety of your choice in the field. We grow about 45 different varieties so that we can provide grapes just in season whenever you visit. To protect certain grapes from the desert climate which can be easily damaged by rain, there is a rain-shielding roof, which allows you to enjoy grape picking regardless of the weather. We use compost and the minimum amount of chemicals to ensure safety and great taste.